Wednesday was a car day. We dropped Jossan and Robin off at Six Flags (yep, second time at Six Flags this time, they bought season passes). The rest of the day was all about getting the car repaired and hire a rental car. 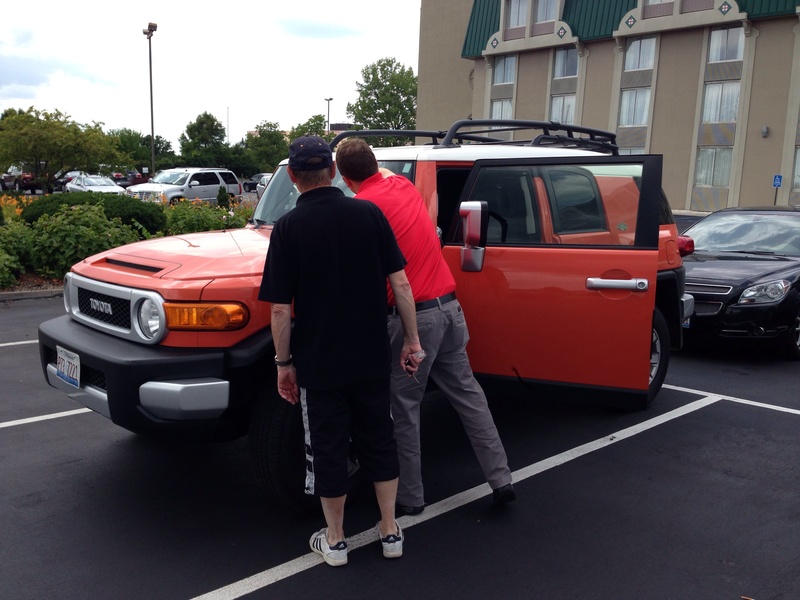 The decision now is to leave the car in St Louis and continue towards Canada in our rental car, an orange Toyota. Great car by the way, you can listen to music, talk to each other, sit in a nice temperature with no luggage all around you seat. Just GREAT!! And I love the color, the car is sooo easy to find, even in big parking lots. I stayed in a small shopping center when Monsieur went to pick up the “kids” and to talk to the repair man. Just strolled around in several stores, lovely. Didn’t buy much, just a “car neck pillow”, a “sleeping pad” and a choklate cake, all in Bed, Bath and Beyond. 🙂 But I tried on nearly 20 dresses, but no, NO, didn’t find the perfect one. Strange, when I am home I just need to go to Joy and I come home with 3-4 dresses/tops (and if I could afford it I could buy half the store, so many nice hings there).